Hybrid is not only here, it is growing, and with that growth it will soon reach far beyond coastal applications. For those who were around for the arrival of Y2K, you will remember the anticipation, preparation and perspiration as the maritime world waited for the failure of communications, navigation, security and machinery associated with the digital change of the clock. The forecasts, now historical urban legend, left the world without a digital catastrophe. We wait now for 2020 and the advent of the IMO maritime emissions regulations. The industry standing by with bated breath to determine which propulsion system or fuel "alternative" will rise to the top of the debate and solve the SOx and NOx issues. Will it be ultra low sulfur fuels, exhaust gas recirculation, scrubbers, LNG, SCR, LPG or methanol? Take your pick if you plan on partnering up with your internal combustion engine. Understand that the plethora of choices leads to the fact that not one is the Holy Grail. We have a difficult decision ahead of us as the majority of alternatives have underlying costs and none at this point look to solve all of the future emissions requirements. We as an industry are under increasing environmental regulatory pressure to step away from our dependence on fossil fuels. IMO GHG is now on its third major study and reports that the maritime industry emits nearly one billion tons of CO2 on an annual basis and contributes to 2.8% of the world's greenhouse gas emissions. The regulations and the debates are not going to end in 2020. Changes are coming. Business looks to engineers and technology to solve industry problems. The environment that business will operate within dictates how that technology develops. Forgive us for a moment to stray away from a technical Hybrid discussion, as we offer as to why Hybrid and EV will soon dominate transportation both ashore and at sea. The electric alternative looks to solve many of the emission problems and if the automotive industry is an indication how technology is seductively satisfying the social demand, then marine EV and Hybrid have growth potential. That growth not only satisfies regulations but also the environmentalists and true believers of climate change debating the issue in social media everyday. Look how automotive EV developed. When was the last time you purchased an internal combustion automobile with a concern on how many miles it traveled before it stopped? Sure, you watched the gas gauge needle approach "E" and turned to the gas station. Was it ever a concern on what was the size of the gas tank to determine your purchase or model? Hybrid and EV announces the limit of their energy storage, the first automobiles traveling 150 to 250 miles on a single charge. The latest marketing efforts lead with new 500-mile capability. Marine EV and Hybrid looked to enter coastal applications for the same reason of limited energy storage. That storage capability continues to become more and more efficient and now dictates our ability to design into longer voyage routes and faster speeds on that same single charge. A marine Hybrid decision is also coupled to the social aspects supporting the technology. Cleaner alternative propulsion developed along populated coasts in tour boat, research and ferry applications. The public wants this in their back yard. Add now the influence of the millennial generation and social media. The average American Facebook user has 70% of their friends living within 200 miles of a home location and roughly 4% abroad. With the world struggling with trade tariffs, protectionism, "slowbilization" and the downturn of global trade, regional transportation and this generation's surge to be sustainable has allowed energy storage and battery technology to develop slowly in these regional markets. That slow steady growth leads to positive technology trends. Some believe that carbon neutrality must be achieved by 2030. Others look towards a more conservative approach and predict 2050. Whether the period is ten or twenty years from now, the answer will be our ability to adapt to new technology and embrace the speed at which that technical information travels. That's a speed that will most likely trim the neutrality prediction to five years along populated coasts simply with social pressure. Not convinced? Watch as the major engine manufacturers, shipbuilders, marine engineers and naval architects tilted their heads at the 2018 Workboat Show when the Enhydra, a 600 person Red & White fleet Hybrid tour boat and latest development of BAE HybriGen won collective accolades, surrounded by the smell of diesel oil and a selection of historical ATB Tug Barge entries and LNG transportation projects. This was a 128' x 30' mono hull developed by Tecknicraft Design with a BAE/Corvus/Cummins 160 kWh generator, control system and AC traction motor drive system built at All American Marine in Bellingham, WA. The applications and markets may be small, but they share common threads. Voyage lengths are limited, the public surrounds the services and speeds are typically restricted. Growth outside of these markets will depend on the expansion of the energy storage systems. Despite these restrictions, the growth in the number of services has not been limited. And that is an important factor to analyze. Ferry system growth is not historically limited to vessel type or size but to infrastructure. More then several East Coast projects never made it to fruition simply because of lack of available parking, land access and NIMBY issues. Those problems have waned somewhat due to what is now defined as "shared mobility." The millennial generation supporting Uber and Lyft car services for their "door to door" transportation needs as they look support waterborne public transportation. The neighborhood and community impact is reduced, as personal automobiles do not enter the traffic patterns and parking flow. Look to companies like Brooklyn-based Switch who are introducing full door to door NYC & Brooklyn EV based transportation from scooter to marine ferry. That generational movement also supports small local business with a social conscience and sustainability. The recent Harbor Harvest Hybrid project taking place on Long Island Sound is another example of this generational shift. The recognition by the Marad Administration, Department of Transportation as a designated Marine Highway project indicates the importance of delivering new marine transportation without environmental impact. Partnered with the newly formed Connecticut Port Authority, Harbor Harvest will deliver local New England and New York family farm products in April of 2019 across Long Island Sound by refrigerated Hybrid Catamarans without emissions. 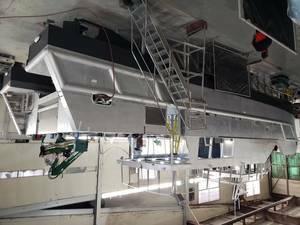 The Hybrid vessels, built at Derecktor Shipyards in Mamaroneck New York, are part of a continuing series of Hybrids developed at the shipyard. The first two developed as research vessels working in Long Island Sound and Rockaway inlet. The third in the series is the first U.S. built Hybrid cargo vessel, a catamaran with refrigerated cargo space and the capability to lift over 12,000 pounds or roughly 28 pallet loads. Marad's interest peaked when the existing Marine Highway legislation designating projects that moved truck, trailer or ISO container was modified in 2016 to include pallet, box and loose equipment. Harbor Harvest submitted their designation application with that legislation change and was approved in July 2018. The vessel employs two BAE Hybridrive systems, one in each pontoon driving an AC motor for propulsion. Two Cummins series QSB 6.7 engines with BAE Hybrigen variable speed generators are used to charge XALT Energy XPAND water-cooled battery systems the actual energy source driving the vessel. Each battery pack delivers 45kWh to propel the vessel at 16 knots. The XPAND battery system uses XALT's pouch format lithium-Ion cells and assisted Harbor Harvest in meeting a 100% U.S manufacturer/U.S. built requirement for Marine Highway grant applications. Their XMP71P-based system is deployed worldwide on many commercial transit buses and trucks and recently received Type Approval from DNVGL. Shore based charging will be available at terminal locations with new charging connections supplied by Lutron Electronics of New York. The U.S. marine Hybrid development path is following the Hybrid & EV marine applications that have quickly become a standard in Norway. Ferry new construction using both full electric applications and Hybrid systems grows each day in number and in total kWh power. We have seen over 16 U.S. information requests for new ferry services and vessels within the New York area alone in recent months. Hybrid is not only here, it is growing, and with that growth it will soon reach far beyond coastal applications.